The 5-Minute Clinical Consult 2013 Standard Edition provides rapid-access information on the diagnosis, treatment, medications, follow-up, and associated conditions of diseases and conditions. Organized alphabetically by diagnosis, this best-selling clinical reference continues to present brief, bulleted points on disease topics in a consistent 3-column format. 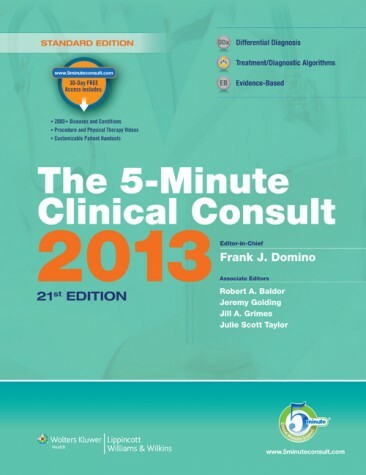 The 5-Minute Clinical Consult has just been released and will be available in store or ordered for delivery to your door through our virtual bookstore.